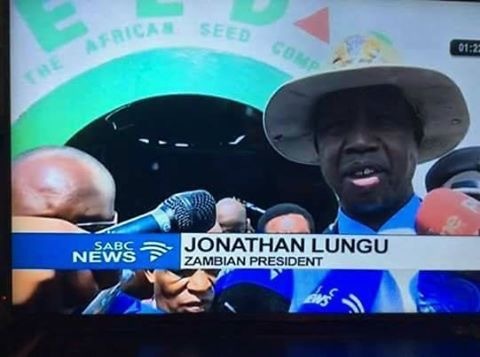 Zuma: Thank you, how is Zambia? ECL: Let’s just get this agriculture show done with. I need to fly out. Zuma: He, he, he, I hear you are toping the presidential air mileage? ECL: I am wooing investors. How is your wife, sorry wives? Zuma: He he he he, they don’t call me JZ for nothing, true player Jigga!! Zuma: I have another small issue to talk about, but I must first thank you for sorting out that young man Musimane, he gives me heat you know. ECL: Your Kitchen is hot. Zuma: I’m attacked everywhere, courts, parliament, on the streets, on Labour Day, at press conference, at funerals of liberators, name it. The pleasures of democracy, but I prefer it now than after office, so that I can enjoy my retirement. Zuma: How is the heat with you? ECL: I am all good. All my puppets and minion say things like “the able leadership of HE Edgar Chagwa Lungu sole candidate in 2021 blah, blah, blah” and I let the police take the heat for me in courts, so far they are embarrassing me. Zuma: Actually this case is what I want to discuss, the whole thing is embarrassing. Zuma: the inauguration at traditional ceremony thing, the motorcade thing, the treason thing, the defamation thing, the fake sabotage thing, the baboon thing, the MP suspension thing. It’s embarrassing. ECL: It’s the law, our law. Zuma: Well, when it’s on BBC, the rest of us don’t care about your laws. The signs of dictatorship have the same colours. Your absurdities are catching up with North Korea. ECL: That’s a stretch, I am not in that league. Zuma: Off course not, but a treason charge based on a traffic incident is top drawer dictatorship. ECL: Did you just call me a dictator, Mr. President? Zuma: No, the Church did, the ones that blessed you in front of the altar, I saw that humbling picture of you and a priest. Things change so quickly. Just release HH. Zuma: I am also called illegal president by DA and the EFF and that’s just over my own house. ECL: As for me I am entitled to a K5million house after serving and a K1.5million grave to be buried in. Zuma: Zuma: Really!! This country is rich, our Madiba has a humble grave, you know. I heard Malema call you a coward, are you? ECL: I will think about that, it might have positives and marital benefits like yours. Zuma: Back to HH, there is no such thing as captor negotiating fairly with captive. Even rebels have better negotiating condition. The whole thing looks ugly, just release the man and when will you lift the state of emergency? ECL: Parliament will debate that. Zuma: Will the baboons participate in the debate? He, he, he , forgive me I joke, I joke. Zuma: But people need a peace of mind to be productive, the risk of getting arrested can put a toll on them, have you ever thought about that? ECL: Let me allow my press aid to prepare a statement on our development discussion. Zuma: One last thing Eddie, off the record. It’s one thing if people don’t agree with your policies but it’s something else if they think you are cruel and immoral.